With their enthusiastic backing of President Obama and the Democratic Party on Election Day, the bluest parts of America may have embraced a program utterly at odds with their economic self-interest. The almost uniform support of blue states’ congressional representatives for the administration’s campaign for tax “fairness” represents a kind of bizarre economic suicide pact. Any move to raise taxes on the rich — defined as households making over $250,000 annually — strikes directly at the economies of these states, which depend heavily on the earnings of high-income professionals, entrepreneurs and technical workers. In fact, when you examine which states, and metropolitan areas, have the highest concentrations of such people, it turns out they are overwhelmingly located in the bluest states and regions. The ironic geography of the Democratic drive can be seen most clearly by examining the distribution of the classes now targeted by the coming purge. The top 10 states with the largest percentage of “rich” households under the Obama formula include true blue bastions Washington, D.C., which has the highest concentration of big earners, Connecticut, New Jersey, Maryland, Massachusetts, New York, California and Hawaii. The only historic “swing state” in the top six is Virginia, due largely to the presence of the affluent suburbs of the capital. These same states, according to the Tax Foundation, would benefit the most from an extension of the much-lambasted Bush tax cuts. The pattern of distribution of “the rich” is even more marked when we focus on metropolitan areas. Big metro areas supported Obama, particularly their core cities, by margins as high as four to one. Besides New York, the metro areas with the highest percentage of high-earning households include such lockstep blue cities as San Francisco, Washington, San Jose, Atlanta and Los Angeles. The income tax hit may not be the only pain inflicted on these areas in the President’s drive for greater “fairness.” Moves to curb mortgage interest deductions for affluent households also would fall predominately on these same areas. The states with the highest listing prices — and the biggest mortgages on average – are the president’s home state of Hawaii, followed by the District of Columbia, New York, California and Connecticut. According to the Census Bureau and the Federal Housing Agency, median home values in California are 200% higher than the national median, and in New York they’re 150% higher; in contrast, red Texas’ prices are below the median. The contrast in prices is even greater between metropolitan areas. The highest prices — and thus largest mortgages — are in the deep blue havens of San Francisco, New York and Los Angeles. If the mortgage interest deduction is capped for loans, say, over $300,000, homeowners in these cities will suffer far more than in key red state cities like Dallas or Houston, where homes are at least half the price. The curbing of the mortgage interest deduction constitutes only one part of a broader effort to cut back on all itemized deductions. This would hit states with the highest rates of people taking such deductions: California, New York, the District of Columbia, Connecticut and New Jersey, according to the Wall Street Journal. In contrast, the states least vulnerable to this kind of leveling reform would be either red states such as Indiana, Alaska or Kentucky, or classic “swing” states such as Iowa and Ohio. Of course, one can argue that these changes follow the precepts of social justice: Rich people and rich regions should pay more. Yet being “rich” means different things in different places, due to vast differences in costs of living. The cost of living in New York and Los Angeles, for example, is so high that the adjusted value of salaries rank in the bottom fifth in the nation. In other words, a couple with two children with a $150,000 income in Austin or Raleigh may be, in terms of housing and personal consumption, far “richer” than one making twice that in New York or Los Angeles. What would a big tax increase on the “rich” mean to the poor and working classes in these areas? To be sure, they may gain via taxpayer-funded transfer payments, but it’s doubtful that higher taxes will make their prospects for escaping poverty much brighter. For the most part, the economies of the key blue regions are very dependent on the earnings of the mass affluent class, and their spending is critical to overall growth. Singling out the affluent may also reduce the discretionary spending that drives employment in the personal services sector, retail and in such key fields as construction. This prospect is troubling since many of these areas are already among the most unequal in America. In the expensive blue areas, the lower-income middle class population that would benefit from the Administration’s plan of keeping the Bush rates for them is proportionally smaller, although the numbers of the poor, who already pay little or nothing in income taxes, generally greater. Indeed, according to a recent Census analysis, the two places with the highest proportions of poor people are Washington, D.C., and California. By far the highest level of inequality among the country’s 25 most populous counties is in Manhattan. Finally we have to consider the impact of the new tax rates on the fiscal health of these states. Four of the five states in the poorest shape fiscally, according to a recent survey by 24/7 Wall Street, all have congressional delegations dominated by Democrats — California, New Jersey, Rhode Island and Illinois (the one red state is Arizona). Slower economic growth brought about by higher taxes — compounded by high state taxes — is unlikely to make their situation any better. So what can we expect to happen if the fiscal cliff appears, or if the President and his party get their taxes on the rich? One can expect a proportionally greater impact on citizens and the budgets of the already expensive, high-tax states, where the new kulak class is concentrated. It may also spark a greater migration of people and companies to less expensive, lower-tax areas. Perhaps the greatest irony in all this is that the Republicans, largely detested in the deep blue bastions, are the ones most likely to fall on their swords to maintain lower rates for the the mass affluent class in the bluest states and metros. If they were something other than the stupid party, or perhaps a bit more cynical, they would respond to the President’s tax proposals by taking a line from their doddering cultural icon, Clint Eastwood: make my day. 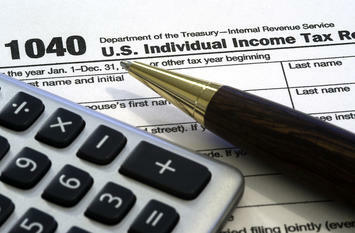 Income tax photo by Bigstock.